After being here for almost 4 weeks, I’ve now settled into a comfortable groove – working during the morning/day and exploring at night. A large thunderstorm made the temperature cool down a bit so last night was the perfect time to dine alfresco. I wanted to stay local so it made perfect sense to return to a place that shared its namesake, Local. Due to having a light lunch of a smoked salmon sandwich courtesy of my favorite delivery spot, Marfa, I couldn’t hold out for the traditional dinner time. So, it was no surprise when I got to Local that it was completely empty. 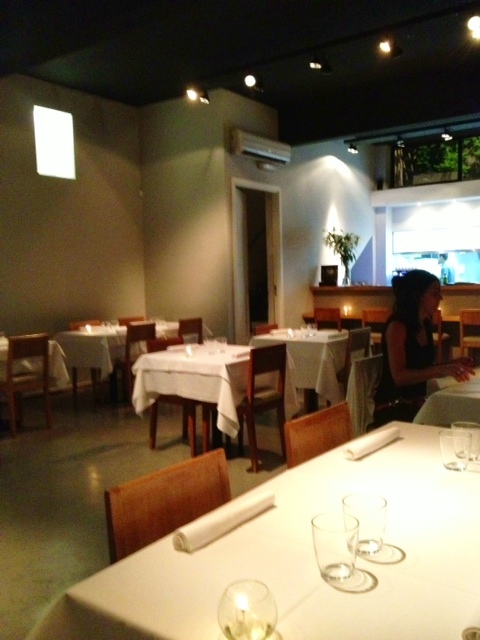 It’s a small, intimate restaurant though so it wasn’t like I was alone in a vast empty space. As much as I wanted to have that delicious wood-fired chicken again, I decided to try something different. The bondiola – pork shoulder – caught my eye but I had to check for garlic. While this was going on, I had already ordered a glass of the Tempranillo from Mendoza but soon found out that, yes, there was garlic in it. Oh well. Although I was actually fine with ordering meat again, the wood oven trout sounded too good to pass up. Of course, that wasn’t exactly an ideal pairing with my wine but so be it. 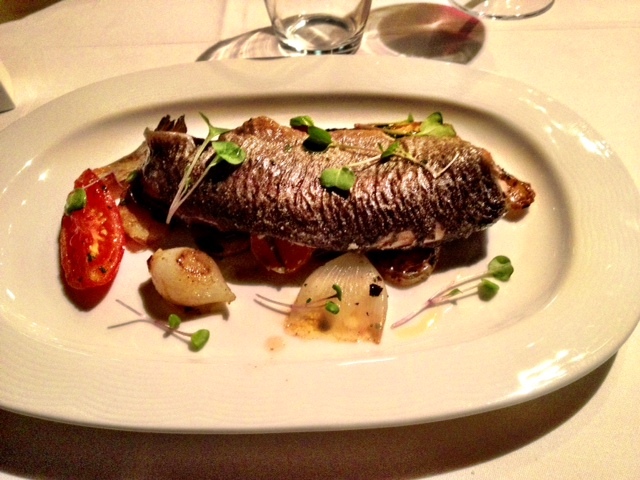 The trout arrived about 20 minutes later (nothing is ever fast in Buenos Aires) and the aroma was amazing. It’s not really clear from the above picture, but the trout was sliced in two. The top as shown, then a layer of delicious roasted potatoes that were square like bricks, and then the other half of the trout. The skin was perfectly crisp, the trout had a surprisingly robust flavor and the roasted vegetables were a great complement to the dish. As I was finishing, the owner, Daniel, walked over to me and said he recognized me from my previous trip there. We chatted a bit about how they source only local products, and Daniel bemoaned the fact that he couldn’t get the lamb he wanted for tonight. He told me I had to come back for their version of matambre, essentially a pork flank steak. I still want to get their chicken again so I guess I’ll have to make 2 more trips there. Yes, I know I’m leaving such a tough life. 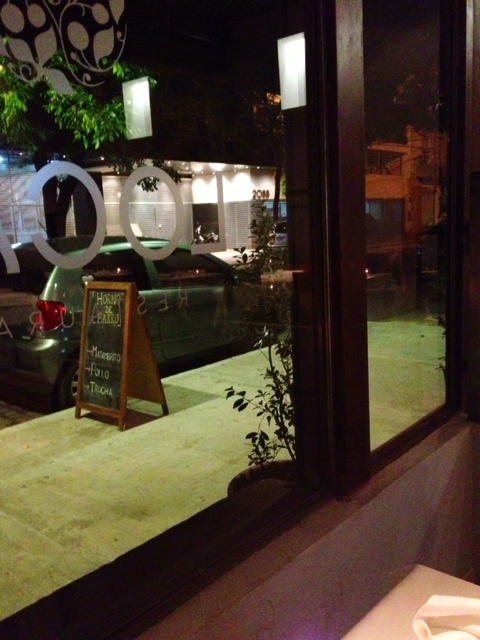 After dinner, I walked a few blocks more to a new-ish wine bar that I noticed last week. 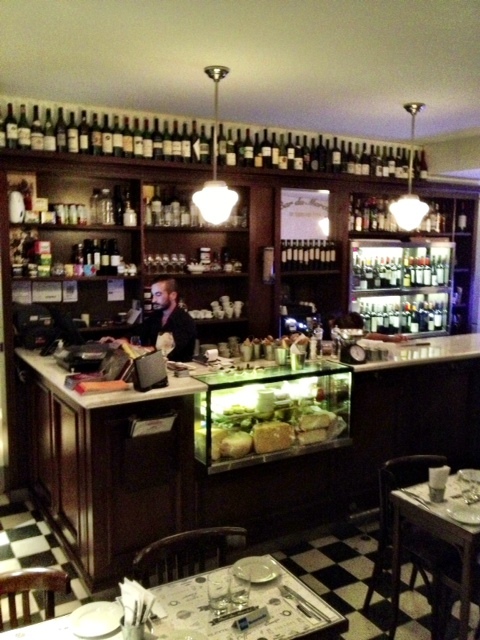 Despite Buenos Aires being a pretty wine centric dining scene, there are surprisingly few places to get multiple options by the glass. Out of that apparent need, Bar du Marche was born. 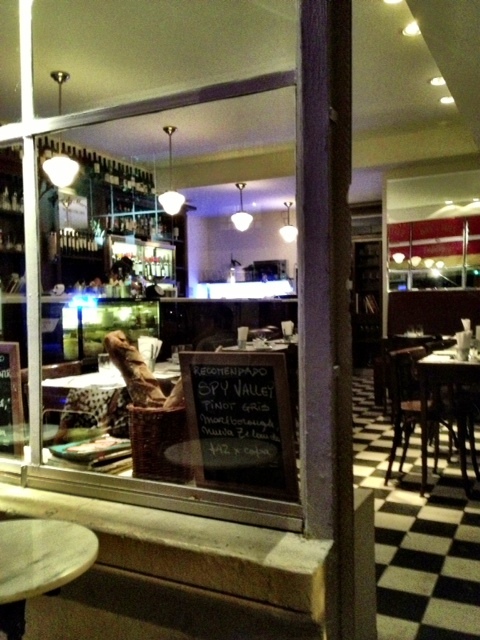 A small, classic French bistro/wine bar, they have an astounding 50 wines by the glass, arranged from lightest to the most robust. I was concerned that it would be mostly French but thankfully the vast majority were from Argentina. I decided to start with a Pinot Noir from Manos Negros, an Argentine winery – a first for me. It was a classic fruit-forward Pinot, which was just what I wanted. I sat at a table outside, enjoying the nice cool breeze and soaking in the local scene. I had to try a Malbec, of course, so I chose one from their Robust section. It was a deep red color and was substantially heavier than the Pinot, in a good way though. It was a very generous pour and at only $45 pesos (which was only $7.50 with my increased buying power) a steal. I will definitely return here soon. Posted on January 18, 2013 by reyalto. Bookmark the permalink.